To celebrate their 25th year, award winning scientific communication studio, Random42 Scientific Communication, have released a brand-new app which allows the user to explore their capabilities in Medical Animation, Scientific Virtual Reality, Augmented and Mixed Reality, and more. This new app features cutting-edge Augmented Reality tech, which uses visual recognition technology to bring content to life. The app lets the user explore the world of AR by simply scanning a page with their smart device, activating interactive scientific animations, holograms and video content. Expect antibodies appearing out of the page and a detailed neuron network signalling right in front of your eyes. This exciting new feature brings traditional marketing materials to life and is just one example of how AR technology can be used to truly engage and immerse your audience.The user can browse visually stunning medical animations on a variety of educational scientific topics, or learn about the latest creative technologies taking over the health industry; including Virtual, Augmented and Mixed Reality as well as a whole host of Interactive Applications, all designed to engage, entertain and educate the user. 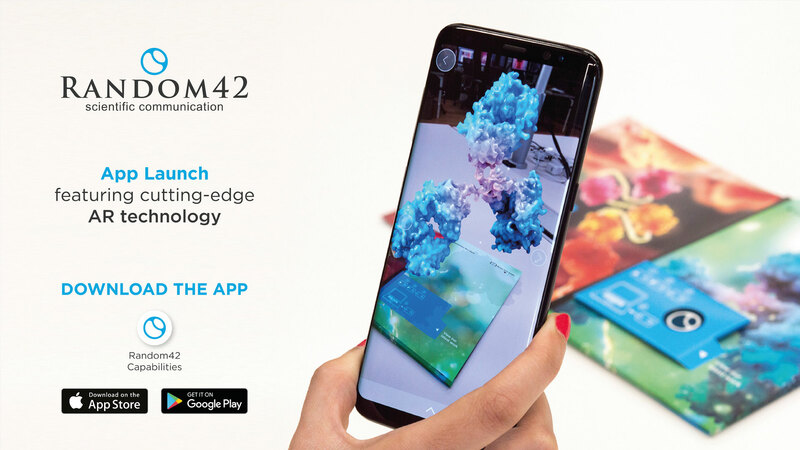 To discover Random42’s full AR experience download the app to your mobile device, available on Google Play and the iTunes store. Once the app is downloaded, the experience can be accessed online or using a physical brochure which you can request on the Random42 website.